Mamoru and Hina return home to find someone playing a piano in the apartment. Mamoru tells Hina to wait outside while he goes inside to investigate. As he enters the lounge room he's shocked to see Zoicite! Zoicite calls him "Master Endymion" and proceeds to play the piano and trigger Mamoru's memories. Mamoru begins to go into a trance but is quickly snapped out of it by Hina who asks if he's okay from the entrance. Mamoru runs out of the lounge room and suggests to Hina that they both go and get some coffee. Zoicite then decides to announce his revival to those in the Dark Kingdom by playing a powerful sonata. Beryl is surprised but pleased as his resurrection symbolises the increasing strength of Queen Melallia. Queen Beryl asks Nephrite if he'll be helping them in their mission any time soon. Jadeite and Malakite take her side and agree that he hasn't been doing much. Nephrite is furious over Jadeite siding with Malakite and leaves. In the dark hallways, Dark Sailor Mercury confronts Nephrite with a proposition but he quickly stops her and tells her that he won't work with anyone's underlings. She tells him that that's fine but he better not touch the Sailor Soldiers. They are her prey. The Sailor Soldiers meanwhile have decided that they all need to awaken as true Sailor Soldiers if they want to free Ami. Rei hears from a girl at her temple that Minako has been performing charity concerts at the Juban hospital so she goes to check it out and ask Minako for advice on how to awaken. When she gets there she and Minako talk about Sailor Moon's recent awakening and how Minako thought Rei would be the first to awaken. Minako asks Rei if she's missing something as a true leader of the Sailor Soldiers. Rei isn't sure what she means but doesn't have much time to think it over as Minako tells her that she's told the hospital that Rei is a singer called "Mars Reiko" and will sing for them! Minako then leaves for her check-up. While waiting for the diagnosis she begins to feel faint and then passes out! Seeing no choice but to sing for the patients at the hospital, Rei heads to Crown Karaoke to practice. After realising she has no idea how to work the machinery she calls Usagi who is more than willing to help her out. Later that afternoon, Usagi, Rei and Luna go to the hospital. Usagi tells Rei that she was so happy when she asked for her help and that it made her feel as if Rei truly trusted her and that her trust in Rei was strengthened as a result of this. Rei is surprised to hear this and thinks back to Minako's words about missing something as leader of the Sailor Soldiers. She was missing trust! As Rei begins to sing, they both sense a Youma in the hospital. Usagi signals to Rei to sing one more song and then join her afterwards. Usagi then runs away and transforms into Sailor Moon. Minako, also sensing the Youma, gets out of her hospital bed and transforms into Sailor Venus. Together she and Sailor Moon battle the Youma and defeat it rather easily. Unfortunately, the whole thing had been a trap and they have now been stuck in some kind of green slime! Luckily for them, Sailor Mars arrives and, now beginning to awaken as a Sailor Soldier, powers up and blasts Nephrite with a super powerful Youma Taisan! 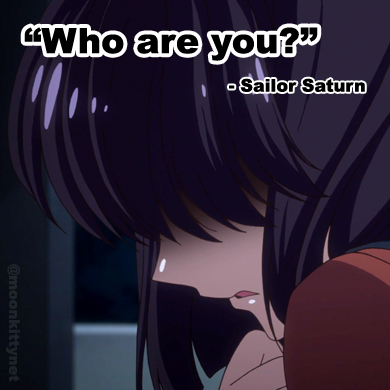 Sailor Venus tells Sailor Mars that she has begun to awaken but she still has a lot to remember about her past. Artemis tells Sailor Mars and Moon that he's sure they can do it and with that he and Venus leave. In the Dark Kingdom, a weakened Nephrite limps in the darkness. Dark Sailor Mercury mocks him for his failure and walks away. Furious, Nephrite picks up a spinning razor staff and lunges at her neck!